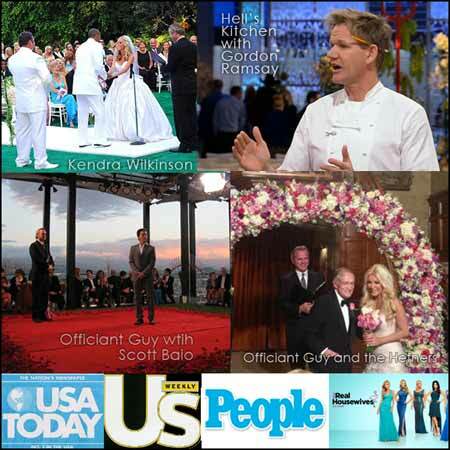 I have performed many celebrity marriages (many celebrity weddings were confidential and those I cannot divulge). Some say I’m a celebrity TV wedding officiant, but I’m just your average guy. Here are some publicized marriages in Los Angeles that I have performed: Hugh Hefner, Kendra Wilkinson, Scott Baio, and Milla Jovovich. I have also been on many TV shows just by chance. Click on Client Testimonials on my Officiant Guy website for the reviews and testimonials for the brides and grooms I’ve helped and many were eloping in Los Angeles, Orange County, and other Southern California Counties.